Social and Search, and a new age power struggle?? I came across two interesting, yet opposing articles on the importance between social media and search. Scott Gillum wrote a post – Social is Intriguing, However Search is Proven – makes the argument that although social media is growing it does not offer anywhere near the effectiveness and impact on the bottom line as does search marketing. Moreover, Scott rightly indicates that search, via SEO and paid search has a proven track record, best practices, and ROI models in place to ensure that marketers can track performance and attribution. On the other hand, Ryan DeShazer, makes a valiant case for social media in his post – For Marketers, Social Isn’t Quite The New Search – stating that in the long run “social will pay off and the onus is on companies to discover their own “killer application.” Yet DeShazer too agrees that search is proven and accountable and needs the investment and consideration of corporates, thereby not getting side tracked by the glitz and glamour of social media. Personally, I believe that the role of marketers is to be in the areas/channels where they are most likely and able to communicate, listen and engage with their current and potential customers. Gone are the days of one-sided conversations, when the marketer spoke and the customer listened and obeyed. Social and search offer two very different communication propositions. Consumers searching for a product have already felt a need for a product/service and are either researching for a solution or comparing between options or in the final stages of making a purchase or looking for the best deal. On the other hand, social offers a myriad of potentials from listening in to what people are saying about your brand, discussing a poor service experience, giving a positive shout out to your brand and perhaps even recommending or learning about your company for the first time. Yes, social doesn’t yet have the intricate ROI attribution and performance metrics as compared to search, but it is still a new channel. Brand are still taking baby steps in the area, some haven’t even considered it as part of their marketing mix, while, service providers are developing new features and users are realizing its power and applicability in their lives. At the end of the day, I don’t think brands can simply focus on one marketing channel anymore and they need to identify the relevant channels and develop an integrated marketing mix to leverage and interconnect them to communicate and lead consumers across the purchase funnel. I think its too early in the process to announce the demise of any one channel. What is your opinion on the topic? Does search require a lot of attention as compared to social or do you think brands need to develop a much more integrated approach towards their marketing? Chime in through the comment button. I have been in India for less than 24 hours and I can see the tentacles of social media spreading across the media and the country. Whether it is press coverage, social activism or articles in print media, its impossible to go through your day without seeing a mention of Facebook or Twitter or an @ or # flashing on the screen. It was interesting to see TV channels like Headlines Today prominently feature a Twitter ribbon on the screen, as well as prominently displaying the Twitter handle of its anchor. As far as I can remember, Twitter did not play such a prominent role six months ago, when I was last in the country. Customer Relationship Management – a word so often used yet rarely put into action. I am a strong believer that companies need to manage, maintain and nurture relationships with their customers, not just when they buy their product/service, but early on in the decision-making process and once the supposed transaction is complete. Yet while many “big” name companies maintain that the customer is at the heart of their operations, that’s often not the case. Finally, I decided to let me followers on Twitter know about my experience. Small as my follower numbers are, it was some respite to tweet about it. I proceeded with my day, hoping to see my phone soon before I headed out of the country. I somehow had an inkling that the company in question might pick it up. But I didn’t have much hope. After all there are probably thousands of people at that moment commenting and it is likely to get lost. WRONG!! 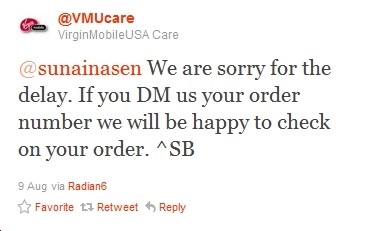 The next day, I get a reply from Virgin Mobile’s handle, apologizing for the delay and asking for details to follow-up. Needless to say I was surprised that they picked it up. Until I noticed near the time stamp the words “via Radian6”. I was aware that companies like Dell and Gatorade had established social media command centers to track the social media chatter. But to truly see the results of the effort is nice. There was a series of tweets back and forth with various @VMUcare reps. I could tell that Virgin had some good practices in place – Virgin social media reps put down their initials at the end of the tweet. I suppose it is a way to tag the individual with the response, this is a really good practice, as it ensures accountability. My story has a happy ending, I got the phone (and totally love Android in case you were wondering). But most of all I was pleasantly surprised by how companies are using social media listening and engagement tools – particularly Radian6 to track customers. If you noticed the initial tweet I sent out, the sentiment on the tweet is mixed. This would have required a moderator to look at Radian6’s river of news functionality, drill down to the specific tweet, analyse it and then respond. A few days later, I had a follow-up question for Virgin about my phone, and got an immediate reply. Of course, for every one player at the top of the game there are laggards. I needed some electronic equipment and walked down to one of the top consumer electronic retailers store in NYC. The customer service experience at the store was terrible, and I walked out despondent. Not only were the employees totally negligent and complacent, there was literally no service. I stood in a line, only to find out that I needed to pay in another area of the store. I left the products with a sales rep and walked out. I decided to tweet about my experience again, hoping that someone could look at it and fix an issue with the store. Its been a few days and I am yet to hear back anything. Granted it was a Friday but it was in the first half of the day. The sentiment on the tweet was negative, and I would imagine Radian6 would have picked it up immediately. Considering the size of this player, I would have expected an immediate response, but nothing. I ran a cursory analysis on the company in question, using TweetFeel and the results were not surprising. The above results show that 60% of approx. 151 twitter conversations on the company in question are negative. This is a small sample size, but an indicator that all is not well. I remember a time when I was back home in India and our air conditioning (from one of the leading manufacturers at the time) had broken down. We waited several weeks to get someone in the company to acknowledge our request and send a mechanic down. There were numerous excuses told and shoddy service provided. Looking at this experience, it is amazing how far CRM has come today. If companies would just listen to what their current/potential customers are saying they can build a strong and loyal following – one that is not easily lured away by a new competitor. The tools are available and the talent is knowledgeable, but it takes a strong belief and dedicated company to back this effort with the resources it needs – irrespective of whether you provide a product or service. What is your experience with CRM and social media? Have you ever tweeted a company about an issue and got a response back? I have Klout!! – Now why should marketers care? As a budding integrated marketer, I often hear and read about the importance of attracting and winning over influencers. For the mock strategy I conducted for the Cisco Cius in an NYU MSIM class, that was a focal point of our strategy, and rightfully so. Companies launching a new service or product need to get their message across to the right people, and what better way to cut across the customer spectrum than identifying and channeling your message to the influencers among your target audience. But who exactly are influencers? There are a number of definitions out there. But for me these are individuals who have the network strength, following and ability to amplify your message and affect the behavior of others. In short they have the ability to influence others. While, a number of tools can help you identify influencers on blogs, twitter (such as http://twittercounter.com/) etc, one tool has blown away the competition – Klout.